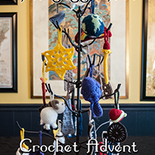 This pattern is part of our Jesse Tree Crochet Advent Calendar collection, which is a set of 25 Christmas ornaments. Each ornament represents a different story in the bible. The patterns are available individually for free on our blog, or you can download a PDF of the entire set of 25 for a small fee. The Jesus ornament represents the story of the birth of Jesus.